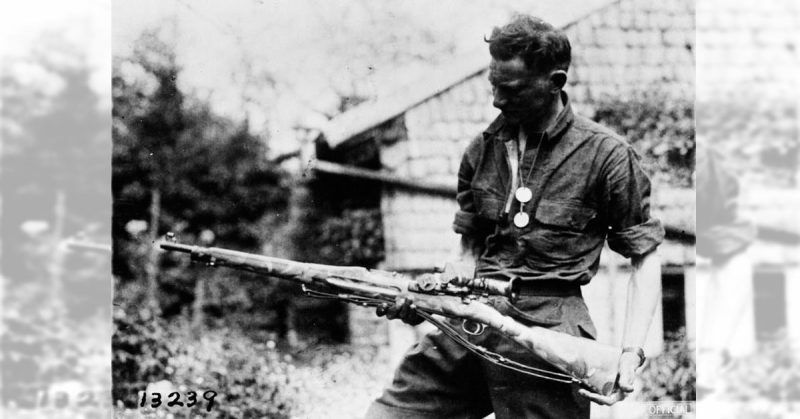 American First World War Official Exchange Collection - Camouflaged Springfield Rifle with telescopic sight used by snipers. Modern rifle sights represent the culmination of almost 300 years of development in optical technology. Though the telescope had been around for a long time before anyone thought to attach one to a rifle, once this was done it was quickly realized that a good scope could hugely improve shooting accuracy. The history of rifle optics in the US is a story of gradual improvement, with improved lenses and reticles giving each new generation of rifle marksmen a slight advantage over their predecessors. And though today there is a huge variety of scopes available for your AR-15 or similar, in basic design they are almost identical to the earliest rifle scopes. Though the telescope was famously invented by Galileo way back in 1608, it was many years before optical technology was fitted to rifles. The reason for this is less to do with optical technology, and more to do with the evolution of the rifle itself. Until late in the 17th Century, rifles simply did not have enough range to require a telescopic sight. Though there are reports of soldiers in the American War of Independence fitting improvised scopes onto their hunting rifles, these homemade devices remained very niche pieces of equipment. They were hard to zero, and even harder to use effectively. The first serious rifle optic in the US, and in fact anywhere in the world, was invented between 1835 and 1840. In The Improved American Rifle, a book published in 1844, John R. Chapman described the rifle sights then being produced by Morgan James of Utica, NY. Though basic by modern standards, the sturdy construction of these optics meant that they stayed relatively true even after a number of shots had been fired, and were therefore the first practical rifle optics. 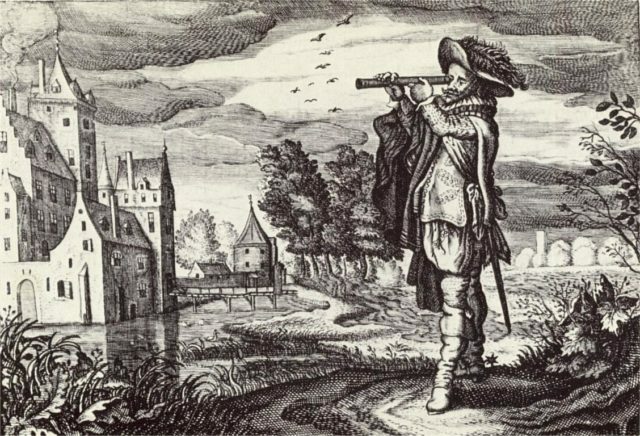 Early depiction of a ‘Dutch telescope’ from the “Emblemata of zinne-werck”- Middelburg, 1624. From about 1850 onwards, a number of US manufacturers began to produce their own sights. The Chapman-James sight was an early success, and was based on a collaboration between civil engineer John Chapman and the manufacturer Morgan James. In 1855, new technology was implemented on these scopes. Early rifle optic manufacturers primarily looked to telescopes to improve their designs, and 1855 saw the introduction of achromatic lenses in rifle optics, initially on the scope produced by William Malcolm of Syracuse, NY. Malcolm’s scope also incorporated windage and elevation adjustments, and these were also to become standard features of rifle optics from that point on. The magnification on these scopes is thought to have been between x3 and x20, though very few survive for analysis. Overall, the Malcolm scope was able to greatly improve the performance of rifle shooters, and became standard equipment for sharpshooters – essentially the first snipers – in the American Civil War. The years running up to World War I, where many nations were arming themselves and seeking even incremental advantages over their competitors, saw big advances in the technology of rifle optics. One such advance was the development of refractor scopes. These scopes allow light to pass directly to the eye of the shooter, improving their ability to see targets in low light conditions. Though refractor telescopes had been available for quite some time, it took until 1880 before the lenses required could be made small and rugged enough for hunting and military use. A related development, also designed to give marksmen an advantage in low light conditions, was the introduction of scopes with extra long eye relief. These low light systems also started the later holoscopic sight revolution. 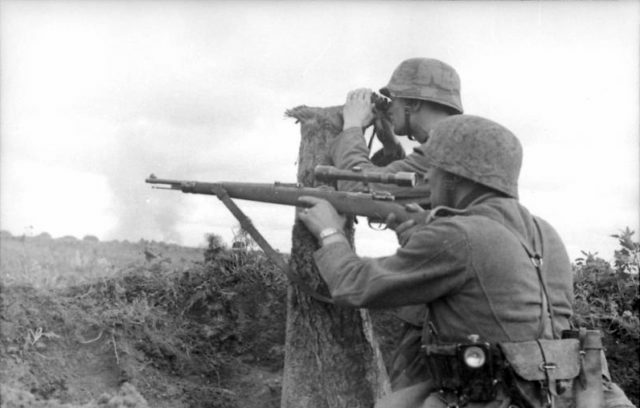 During WWI, initially the German Army seized the initiative when it came to rifle optics. Recognizing that trench warfare provided plenty of hiding places and large cleared areas, and was therefore perfect for snipers, they quickly put 25,000 then-advanced scoped rifles into the hands of their soldiers. Germany had long been pre-eminent when it came to optical design and manufacture, and the US was forced to play catch-up. The first solution was a bit clumsy, but also effective. The US Army mounted a x6 magnification Warner and Swasey scope on top of the .30-06 M1903 Springfield rifle. Though this weapon was pretty hard to carry around in combat, it reduced the gap between American and German Army snipers quite effectively. WWII saw the fastest development in rifle optical technology to date. Advances in rifles, and specifically the move toward smaller caliber, but also more powerful, rounds meant that effective range rapidly increased, and scope magnification followed suit. The most advanced optical systems used by US Army soldiers in this period was the 2.5x magnification Lyman Alaskan, fitted to the recently standardized M1 rifle, and the x10 magnification Unertl scope. This latter scope was a favorite of snipers in particular, because it gave huge range and was easy to adjust to unfavorable weather conditions. The later period of WWII also saw the beginnings of night vision on rifle scopes. Advances made in previous years had led to scopes being reasonably effective in low light conditions, but a true night-time system was still unavailable. The German Army’s Vampir was one of the first of these systems. 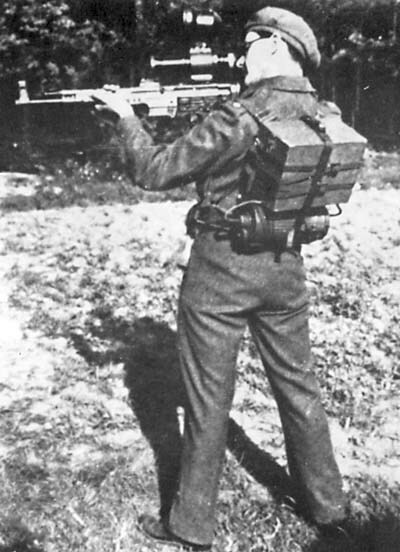 It was developed for the StG 44 assault rifle, rather than a longer range weapon, because at that time it was still felt that soldiers would not be able to hit long-range targets at night. Rather, the Vampir used an active infrared system to provide close-quarter visual capability for infantry soldiers. Though crude by today’s standards, this scope represented perhaps the last major advance in optical technology before the modern era. It was effective in combat, allowing the German Army to fight in lower light conditions than their enemies, but it’s introduction in 1944 came too late to greatly influence the outcome of the war itself. The Korean conflict saw little further development in rifle optics. The role of the sniper in this war was not as great as they had been in WWII and later in Vietnam. Most of the combat in Korea was conducted at close range, and between mass build ups of infantry and artillery troops, and soldiers of this period did not train so thoroughly with magnified scopes. That said, the telescopic scopes developed during the Second World War had by this time trickled down to civilians, and the 1950s saw the first large-scale civilian adoption of scoped rifles especially for the later AR-15 models. Initially, scopes of this period offered a pretty basic aiming reticle, and x6 magnification or lower. 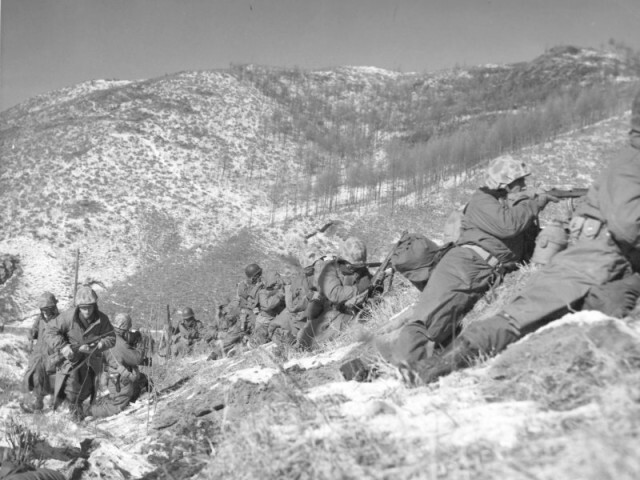 Marines engaging the Chinese during Korean war. However, as hunters gained ever more powerful rifles, and demanded scopes that provided accuracy out to ever expanding ranges, scopes for civilian use began to offer up to x20 magnification. In addition, the increased effective range of these weapons meant that windage and bullet drop reticles became available for the first time. Though these scopes can be difficult to maintain and zero in comparison to modern scopes, the fact that scope mounting was standardized in this period means that it is still just about possible to use a Korea-era scope on your hunting rifle today. The war in Vietnam saw the largest use of long-range scopes up to that point. Though during the Korean War the role of snipers had become a little overlooked by military planners, Vietnam saw their stature and effectiveness increase dramatically. The story of rifle optic development in Vietnam is a slightly strange one, and largely focuses on one man – now legendary scout sniper Carlos Hathcock. In a moment of inspiration, Hathcock managed to source a pretty basic telescopic scope, and mounted it onto his M2 .50 cal heavy machine gun. Though never designed to operate as a long-range weapon, when used in single shot mode the M2 delivered huge range and power. It still required a well-trained soldier to operate, of course, because firing .50 cal rounds from an unmounted machine gun means that a huge amount of recoil is generated. Marine loading .50 cal in Korea. In the hands of an expert, however, the scoped M2 was lethally effective, with Hathcock using one to achieve the then-record longest kill for an infantry soldier, at 2,286 meters. Though extending the US of rifle optics to machine guns, or even to .50 cal weapons, was viewed with scepticism for a long time, it was gradually recognized as an effective combination, and in 1990 the US Army purchased a consignment of .50 cal BMG M82 Barrett for use as a sniper rifle. 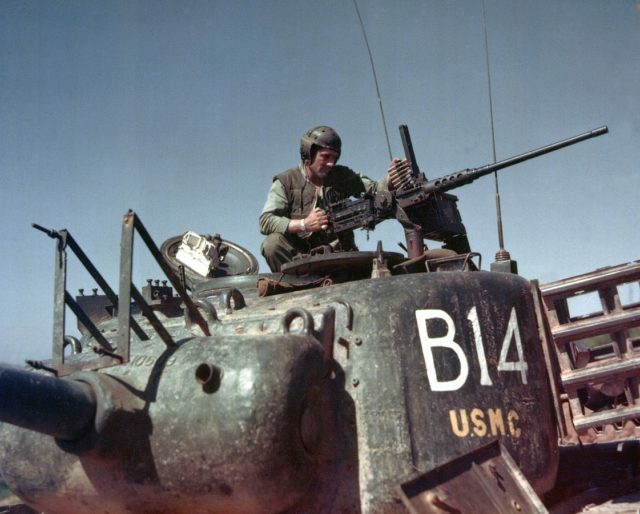 This proved so effective that it was later standardized as the M107. US rifle optics, it could be said, stayed relatively standard between the end of WWII and Vietnam. However, in the years since there have been huge advances in optical technology. As this technology has advanced, each new development has been incorporated into rifle scopes, and as a result the effective ranges achieved by these weapons have more than doubled since the Vietnam conflict. Perhaps the most dramatic increase in the capability of rifle optics in recent years has been the enormous increase in standard magnification. It is now not unusual to see x10 magnification scopes fitted as standard to hunting rifles, a level of magnification that was reserved for the most highly trained snipers of the WWII period. Advances in glass manufacture, and the increasing use of transparent polymers, has also meant that the light transmission of these scopes has greatly improved. This means that even a 50mm scope provides an excellently lit image in the viewfinder. Another huge advance has been the use of variable magnification. Though first developed in the 1950s, this technology did not become widely available on civilian optics until the 1990s, and has revolutionized the shooting practice of many hunters and amateur marksmen. Until the modern period, there remained a need for the serious rifle shooter to own a number of scopes – at least one for long range hunting, and another for short range pest control or similar. Variable magnification, by allowing the user to manually change the magnification offered by the scope, did away with this hassle. Another area of development has been the several ways in which lasers technology has been incorporated into scopes. Most shooters today will be familiar with the use of lasers in rifle optics primarily from the availability of red dot sights, where a low-powered laser is used instead of a traditional aiming reticle. These sights can be very effective when hunting, especially at short range, allowing the shooter to see precisely where their weapon is pointed. However, lasers have also been incorporated into rifle optics in other ways. Advanced long-range rifle optics now use lasers to measure the range to the target. Though, for most people, a range finding reticle should be more than sufficient to estimate range, for those who need to take the longest-range shots laser range finding provides an instant and very accurate way of finding a precise range. One of the most recent changes to rifle optics, but one that has quickly become very popular, is the use of illuminated reticles. As night-vision technology has increased in availability and decreased in price, many now find themselves hunting at dusk or dawn. In these situations, though an illuminated reticle is not absolutely necessary, it certainly helps. This said, some have criticized the first few generations of this technology, because without proper adjustment illuminated scopes can hamper the hunter’s night vision, and ultimately make them less effective. For the most advanced users, and those in the military, the next advances in US rifle optics are already becoming visible. In 2007, the Barrett Firearms Company introduced a system known as BORS. This system is essentially an automatic, electronic module for automatically calculating bullet drop, and adjusting a scope’s reticle automatically. It is designed to work out to 2,500 meters in combination with certain scopes made by Leupold and Nightforce, and this range is indicative of the extreme distances across which modern snipers are expected to hit targets. What comes next, we can only guess. One suggestion is provided by the ELCAN Digital Rifle Scope series, which replaces the traditional refraction lenses of rifle scopes with a fully digital system. If this is the way forward, it will represent the biggest change in scope technology since the invention of the rifle scope way back in the 17th Century. However, only time will tell.